Yay! I got the latest issue of the APS Peony Bulletin - September 2012 with my article in it. How exciting! Here's a reprint of the article. Enjoy! 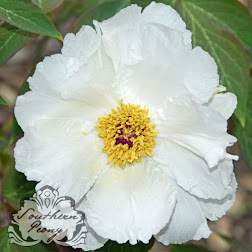 The 2012 American Peony Society Convention was held in Omaha, Nebraska this year, and despite the lack of a local ‘host’ peony club, the convention was well organized, had a great showing of flowers, and had lots of extra activities to keep you busy! 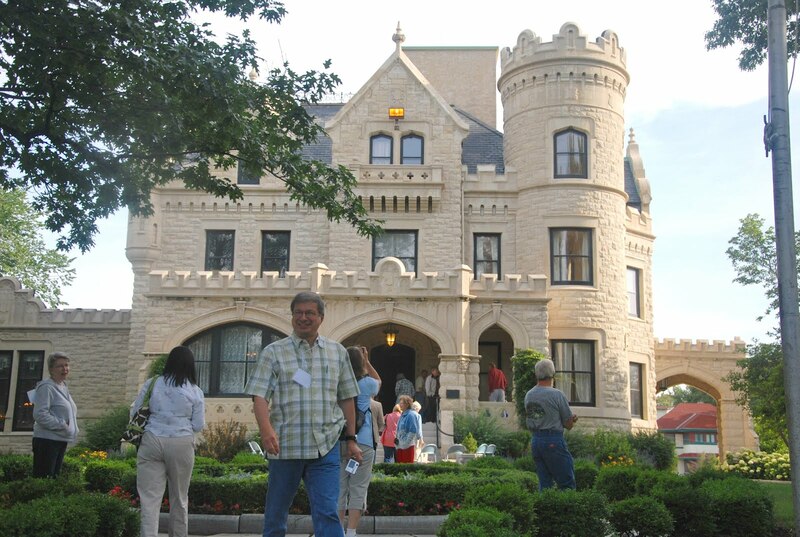 On Friday we visited Joslyn Castle. The grounds of the Joslyn Castle were rich, well landscaped, and nicely manicured. However their beauty did not rival that of the castle. Though it lacked the company of its original furniture, the castle was finely appointed in detail and craftsmanship. From the tiny mosaic inlaid tile to the hand carved mantels and archways, the time and attention to detail was obvious. One of my favorite features was a set of 3 stained glass windows nestled above a comfy cushioned window seat overlooking a tiny yet full and lush conservatory of moisture loving plants including ferns, tropical foliage, and orchids. It also contained a small waterfall and pond, with the noise from the water feature bringing an element of the outdoors inside which, I’m sure, was enjoyed with even greater pleasure in the winter months. Unfortunately the peony bloom season had already passed. So the century old peonies boasted only bare foliage and cut flower stems. 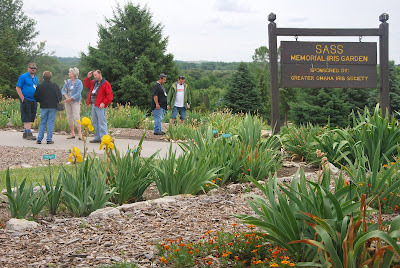 After visiting the castle we headed to Mahoney State Park to visit the Sass Memorial Gardens. The flowers came super early this year to the Sass Memorial Gardens. So we missed them by about a month. However the lack of a distracting abundant floral display gave additional opportunities for the APS members to socialize and discuss the drastic difference in the weather this year and how it affected their own peony bloom seasons. After visiting the State Park, we headed to Lauritzen Gardens for lunch and a tour. Lunch was simple, but delicious, and a welcome break. 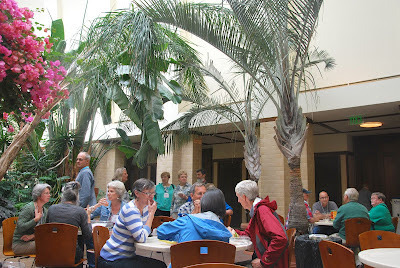 The catered lunch was held in the Lauritzen Gardens indoor atrium which was filled with lush tropical plants including beautiful hot pink bougainvillea tree. 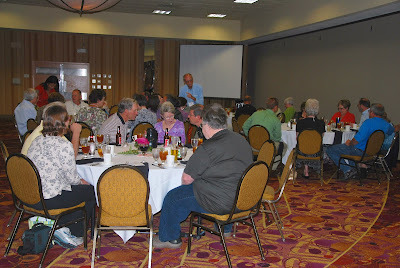 The Award of Landscape Merit training meeting given by Don Hollingsworth immediately followed the lunch. APS members had their choice of the ALM meeting or additional tour time in the garden. Lauritzen Gardens was a beautiful garden with a contrasting mix of nicely manicured, carefully landscaped areas and fields of wildflowers and open natural areas. In addition to a peony garden, there was also a rose garden, a Victorian garden, a miniature train garden, and much more. 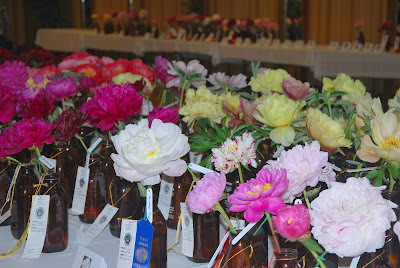 The 2012 American Peony Society flower show was huge even though most of the growers complained about their seasons. I think they were just trying to set the judges' expectations a bit low so they could shine. Everyone was busy with preparations on Saturday morning trying to get ready for the cut off before the judging of the show. 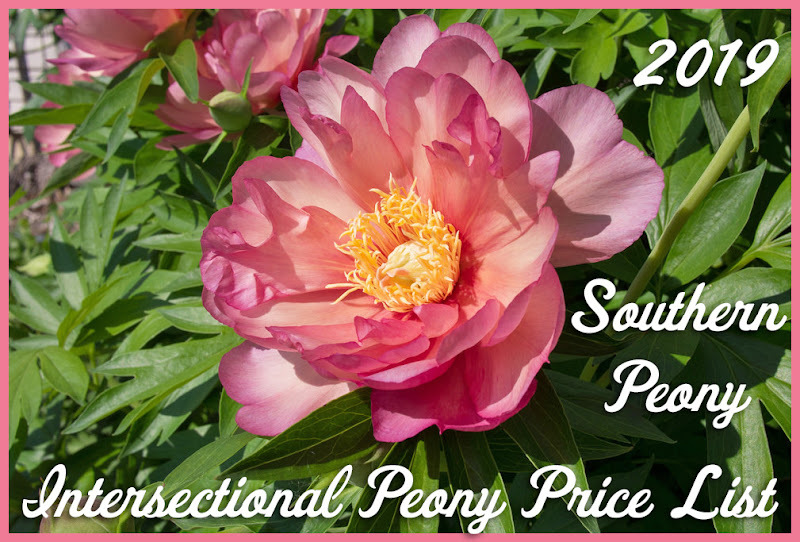 The color of Peony 'Hephestos' must have captured the hearts of the judges this year. What a rare and dark color, which is fitting for the god of blacksmiths. It won the Court of Honor for Best Red Lutea Hybrid, and also the Grand Champion Peony, Best of Show ribbon. The social hour started early and lasted long. The room was cold, but the hearts were warm as everyone socialized and waited for the business meeting and banquet dinner to begin. The business meeting was short and sweet with three new board members elected. The buffet dinner was tasty with beef, salmon, mashed potatoes, veggies, salad, and bread. We all listened to a presentation on the Sass Brothers’ hybridizing feats including all of the medals they’d won over the years. One of the highlights of the talk was the announcement that he’d brought the actual 1943 APS Gold Medal that the Sass Brothers had been awarded (for Peony ‘Elsa Sass’) for everyone to view. The APS Editor, Claudia Shroer, made sure we all had our dessert, and it was very good, a red velvet cake. However the peony auction may have been even better. Lucas Hudson, the APS Secretary, conducted a lively APS peony auction as usual, and there were lots of rare and prized peony varieties to bid on.